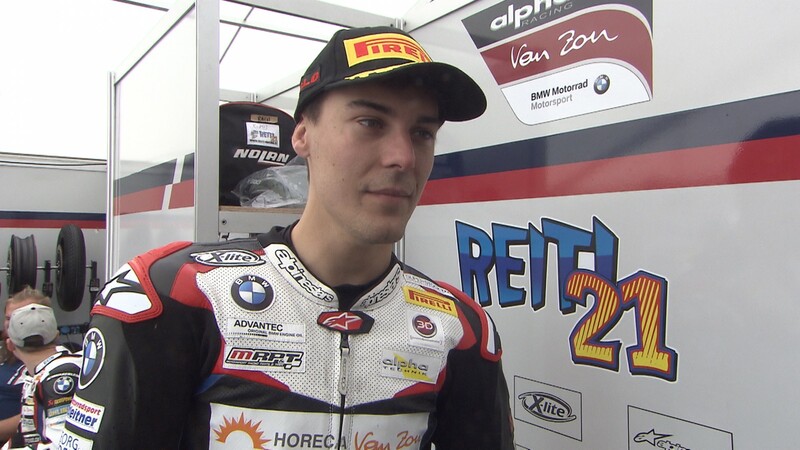 In his return to the European Superstock 1000 Championship, Markus Reiterberger (alpha Racing-Van Zon-BMW) secured the pole position at the MotorLand Aragon circuit with a time of 1:51:427. The German rider, also dominant in Free Practices 2 and 3 of STK1000, gave no options to his rivals. Italians Roberto Tamburini (Berclaz Racing Team SA) and Federico Sandi (MOTOCORSA Racing), 0.558 and 0.579 seconds away respectively, will accompany the German on the front row of the grid. Starting from fourth will be Maximillian Scheib (Aprilia Racing Team), just ahead of debutant Jan Bühn (alpha Racing-Van Zon-BMW) and Luca Vitali (Aprilia Racing Team). Florian Marino (URBIS Yamaha Motoxracing STK Team), who scored the seventh best time of the qualifying session, will lead the third row ahead of Alessandro Andreozzi (SPEED ACTION), who just returned to the STK1000 category as a regular rider, and Emanuele Pusceddu (D.K.Racing). Starting from 10th will be another debutant in Alessandro Delbianco (GULF ALTHEA BMW Racing Team), managing to position himself in front of Luca Salvadori (Berclaz Racing Team SA), 11th, and Riccardo Russo (C.M. Racing A.S.S), who will come out 12th in his return to STK1000 after riding in WorldSBK. Don’t miss the STK1000 Warm-Up and Race of the Pirelli Aragon Round, this Sunday from 10:10 (08:10 GMT), thanks to the WorldSBK VideoPass.